A Blessed Life-everyday life with Lisa Dorsey: Do you boo? Basically you fill a container (does not have to be anything fancy) with a few goodies and secretly drop it at the door of two friends. In the container should be a poem telling them what to do. You can find them all over the internet. Here is the one I used. You also need to include a ghost that they hang in their window so everyone knows they have already been boo'd. 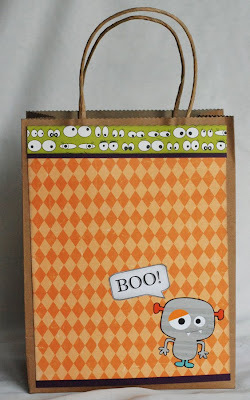 To create this quick little bag I simply used one of the Kraft bags from Emma's and covered it with Happy Halloween Magic Stripes Paper by Echo Park using Glue Lines to make sure the paper didn't fall off. I then cut a strip of Monster Stew Cup of Eyeballs Paper by Jillibean Soup, matted it with purple and attached it to the top of the bag. I cut out one of the cute creatures from the Whoo-ligans Monsters Pattern Paper by Bo Bunny Press and attached him to the bottom of the bag. I then printed a speech bubble in Microsoft word, inked it up and I was done. 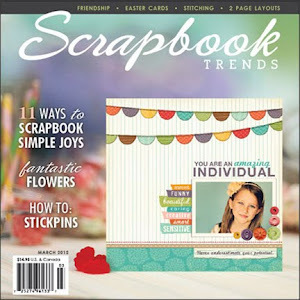 I also wanted to let you know about a Facebook promotion that Creative Charms is running right now. Anyone who buys both the Kit of the Month and one Deal of the Month will be entered to win $25 gift certificate. If anyone buys both Deals and the kit they will be entered twice. Thanks for stopping by everyone and have a wonderful day! What a cute idea!!!! And the bag is adorable!! Oh, don't you just LOVE Boo'ing? It's one of our favorite activities this time of year. Even my son, at 15, still likes to Boo. Such a fun game! And your treat bag is absolutely adorable. I sure wish we could be Boo'ed by YOU! That is really cute. I've never been boo'd. Maybe I should start boo'ing people here! oh gosh is this cute and such a good idea!